Disney CEO Bob Iger has suggested that Disney+ will be coming to Apple TV devices, in spite of speculation that it would come into conflict with Apple's new streaming service, Apple TV Plus. 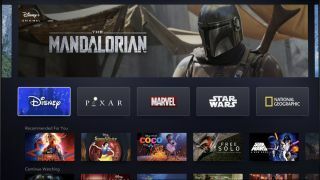 During an interview with Bloomberg following the announcement of Disney+ launch date, pricing, and availability information, Iger said: "The app will in all likelihood be available through traditional app distributors, Apple being one of them." "So I'm fairly certain that if people want to buy the app — sorry, subscribe to the app is probably a better way to put it — they'll be able to do so through Apple and the iTunes Store." It's important to note that Iger's comments don't amount to an official announcement from Disney+, and as an Apple board member, it has been suggested that his involvement in both companies could amount to a conflict of interest. When this was put to him by Bloomberg, Iger said that he was "mindful of my fiduciary responsibility to Apple shareholders as a member of the board", even though his own company's new TV streaming service will likely be one of Apple TV Plus' biggest competitors. Iger's comments come after the announcement that Disney+ will launch in the US on November 12 for $6.99 per month or $69.99 per year. Launch price and dates in other regions are still to be confirmed. The service will feature five different hubs, containing the major franchises belonging to the entertainment giant – Disney, Pixar, Marvel, Star Wars, and National Geographic. As such, lots of new content has been announced, including Marvel shows featuring Hawkeye, Loki, Falcon, Winter Soldier, Scarlet Witch and Vision, a new Star Wars series titled The Mandalorian, and new series’ starring classic characters from the likes of Toy Story and Monsters, Inc.